Alan will be responding to the challenge this week, so we thought we’d cover an objection that has to do with Islam. Have you heard someone argue this? Christians complain that Islam’s teaching of jihad makes it a violent religion, but the same thing can be said about Christianity. The Old Testament is full of wars, killing, and slaughter committed in the name of religion! And what about all the violence and killing during the Crusades and the Spanish Inquisition? There’s an obvious parallel to jihad in Christianity. So what do you think? Does Christianity have its own jihad? Tell us how you’d react to this claim, and we’ll hear how Alan responds on Thursday. Lots of possible avenues, but for now, just this. When was the last violence in the name of Christianity which was not condemned by Christians and when was the last in the name of Is’lam? confer http://www.BiblicalThought.com (Sep. 9, ’10, associated with Robert A. Morey, author of “The Islamic Invasion”). They are prohibited from asking their Clergy hard questions. They regard as Enemies those who “expose our religion,” as their Scripture (Hadith?) says. Well, this post isn’t meant to “slam.” Do you have any thoughts on the challenge about “Christian jihad”? 1. The Old Testament needs to be read and understood in its historical context. I would want to focus on specific examples. Where is there any of these things done “in the name of religion”? The slaughtering of the Canaanites, for example, was a just and holy God using His chosen people as instruments of righteous judgment. The purpose was not to forcefully convert them to Judaism or to kill them just because they weren’t Jews, but rather to inflict a just punishment on a people who were morally debauched and wicked. God had warned them and given them 400 years to repent, but they refused. There is no obvious parallel to Islamic jihad in this example. Besides, the Old Testament is recording historical events of the Jewish people; there was no Christianity yet. So, arguing for jihad parallels in Christianity from OT examples really misfires. 2. With respect to the Crusades and Spanish Inquisition, this hits much closer to home as far as parallels to jihad. The key point here, however, is whether or not these were done in consistency with the teaching of Christ and the New Testament. I would point them to the Sermon on the Mount and a passage like Romans 12 and argue that the Crusades and Inquisition were clearly in direct violation to the teachings of Christianity. Also, ask the question, “would Jesus have participated in this?” The answer is obviously no. In the case of Islamic jihad, this is very different. My understanding is that these acts are done in consistency with the teaching of their scriptures. Alan, you are more informed on this issue, so I look forward to you response. By the way, The Ambassador’s Guide to Islam is an excellent resource and I highly recommend it to all. Thank you and God bless. Right now, no, Christianity doesn’t have its own Jihad. Of course, it hasn’t been all that long ago that the natives of the America’s were forced to take the Christian religion, and even when they did they were still treated as less than people, and if they didn’t convert they were either killed out right, given blankets that once belonged to small pox victims, or chased into lands that were, for the most part, uninhabitable. Of course the New Testament, unlike the Koran, condoned none of this. The employment of the Christian crusades was a response to the ever growing and extremely violent Islamic Ottoman Empire. The Islamic Ottoman Empire captured, pillaged, destroyed, massacred and slaughtered thousands of Christians and Jews living within the existing Byzantine Empire, i.e., the Middle-East. Undeniably, the attempt to destroy Christian Byzantium is indicative of contemporary efforts to spread Islam within Western democracy. The only difference being Western democratic values allow for subtle sociological conversion to take place; rather, than violent coercion. Therefore, I see absolutely no good reason to believe that the Christian Crusades, a response to reclaim stolen land, can be considered justifiable comparable to actions which epitomise the nature of Islamic Jihad. The texts instructing war found within the Old Testament reflect the Mosaic law–adjudications that were relevant to the time and era of the Jewish civilisation’s questioned. Irrespective to that fact: Humans ought not to speculatively and presumptuously place our finite epistemic moral reasoning capacities on that of God. For example, God, by virtue of His nature, is the Greatest Being imaginable, therefore, His reasoning capabilities are infinite. Thus, the moral decisions He makes may rest ethically viable premisses–atheists may not see it, Christians may not see it, but we ought not assume our moral limitations are applicable to God. Indeed, I have been compared to Moslem terrorists by my manager for professing my faith @ work. It would be great to see other believers be bold in a (non-violent)Jihad for Jesus! I have to say that that’s the most interesting and untrue comparison i’ve ever seen. But I notice an immediate hostility to Chrisitianity at my school and not to other religions when I mention it. And they say they’re “tolerant”. And I would advise not using jihad to describe it because I have seen clips of muslims engaging in non-violent jihad that goes something like this for the more radical ones: “To hell with Obama” and “Down with America” and those types of things. I don’t think you want to be associated with such an abusement of free speech in america. As Jesus said in Matthew 10:16 ” 16 I am sending you out like sheep among wolves . Therefore be as shrewd as snakes and as innocent as doves.” So, no need to violently inveigh america or anyone else. But yes, I do agree in the struggle for Christ. I’ll try and pray for you. Well, lets consider the past for a second first. When are the most notable jihad like events in Judeo-Christian history. Well, I remember mainly two, those being the Israelite conquest of the promised land and the Crusades. First, to talk about the conquest in canaan one must observe as Philip Motes says, that the Israelites and by extension God, were inflicting perfect judgement on people who chose not to repent. There is no forcing religion on people (which the muslims did not really do at first) or taking their wealth to get wealth (which muhammad did do) but destroying nations that engaged in vile practices and had probably heard rumor of what happened to others. Then you kind of run into the does God exist question maybe to show actual justification for that. Secondly, the Crusades. Alexius, the emperor of the Byzantine empire was calling for help from Europe after losing a battle to the seljuk turks at the battle of manzikert. The pope saw it as a way to possibly reunite the church after the Great Schism in 1056 but this failed to work out. Many of the Crusaders were not interested in sharing their faith but in killing their enemies without knowing why. Many were also motivated by the chance for political power of economic wealth. They were mistakenly justifying their probably greedy actions by saying it was for Christianity. This may have been caused by the fact that most people didn’t have access to the bible in their vernacular until gutenberg. I do have to say that Dimmitri C. is mistaken that the ottoman empire was around at that time because it did not rise until after the crusades. Also, the ottomans were more tolerant of other belief systems than any other empire at the time. They even invited Jews to come to the empire after they were kicked out of spain during the reunification of Castile and Aragon in 1492. And speaking of modern Jihad with regard to Islam, most of the texts were taken out of context that speak of killing others. But one must be wary because many muslims water down jihad not to mean neccessarily holy war but struggle or inner struggle and then say that they have jihad just be resisting for example western influence. I also agree with Philip Motes’ second point in that may of these so called Christian jihad movements are in direct contradiction with the teachings of the bible. The Crusades were for political and economic reasons while the spanish inquisition was for unification in spain politically as the spaniards saw themselves as the champions of Catholocism especially after the Protestant reformation began in 1521. I would have to say that when looked at more deeply and at a historical perspective with good biblical knowledge, the comparison really falls apart. Please excuse my rambling. And thank you for the challenge. I think there would be a couple things that I would point out. 1. 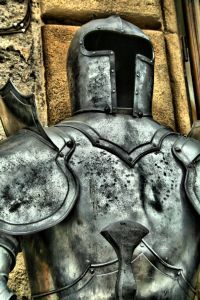 The first thing that I would point out is that even if this writer is right in his claim that Christianity has it’s own jihad, it doesn’t refute previous arguments for the truth of Christianity, i.e., Kalam Cosmological Argument, Moral Argument, the evidence for the Resurrection of Jesus, ect,. Even if his claims are true and accurate it does nothing to detract from the arguments already presented as evidence for the Christian faith. Of course this does have some rhetorical force. I’ll admit that. But it misses the point. We have to look at the facts. We need to look at the data and come to a conclusion that is justified by the given evidence. And I would agree with Greg that most people have not looked at the data thoroughly. Instead of objecting to some premises to our arguments he tries to get by with a simple dismissal. He first has to deal with the facts before he can be justified in dismissing any claim. 2. It seems to me that he is committing the straw man fallacy. He is painting a picture of the God of the O.T. and His people that is meant to imply that these “wars, killing, and slaughter committed in the name of religion” are unjust and/or unethical. If he thought these acts were in fact just acts then he wouldn’t be objecting to them to begin with. In order for him to have a case for his claim is for him to present reasons why he thinks his view is to be the one that ought to be believed. He can’t just make a claim and consider that evidence, or as is taught at STR “an explanation is not a refutation”, and this applies to this challenge as well. He can’t just make a claim and expect us to prove him wrong–he holds the burden of proof. And if this is what he is presenting to persuade others to his view–he is presenting something that is rhetorically powerful but not intellectually satisfying or persuasive. Addressing the wars that the church has been involved in in the past, does the behavior of the church somehow mean that the Bible isn’t the word of God, that we aren’t sinful human beings in need of redemption, that Jesus didn’t get crucified and rise from the dead, and that we can have forgiveness through faith in Him? That’s a non-sequitur, it doesn’t follow. The veracity of Christianity is independent of how some people in the church have behaved. In fact, the Bible even makes it clear that some people who don’t belong to Christ will be in the church (Acts 20:29-30) and that Christians themselves are imperfect sinners who do stupid things sometimes (it doesn’t take much reading through the Bible to see God’s people doing stupid, sinful things). While God may have had the nation of Israel destroy neighboring nations as a just punishment for their sins, as the church we are to emulate Christ and His teachings, like loving our enemies and praying for them. Christianity does not have it’s own jihad. We must not be so careless as to not realize that the term “jihad” itself is a religious term specific to Islam. The particular usage of jihad (meaning “struggle”) being referred to here is in the physical sense that Muslims are called to defend and spread Islam through means of physical warfare and violence. This can be seen in multiple instances throughout the Koran and I refer you to here to see such instances http://www.answering-islam.org/Quran/Themes/jihad_passages.html . Now while a case for something like Jihad in the Old Testament may be arguable, it must be understood that the commands in the Bible that would appear to be similar to jihad were strictly prescriptive for the nation of Israel AT THAT TIME, whereas the commands found in the Koran are FOR ALL TIMES. Commands to kill were never given in such broad terms as found in Koran, and were always specific to the particular historical context.Also, we are making a defense not of Judaism, but of Christianity. Yes Christian doctrine relies heavily on the Old Testament, but it is not limited to that and it sees it’s completion in the New Testament with the coming of New Covenant. Regarding “Christian” violence in the Crusades and the Spanish Inquisition, it is certain that such acts were not Christian at all; in fact they were anti-Christian. In cases of such “extremism”, ironically the problem is not that these people were too Christian, but rather that they were not acting Christian enough. They were lacking everything Christian, because you will not find a shred of scripture supporting such actions unless it has been twisted and has been subject to eisegesis. Therefore, because of the limited application of OT commands towards violence to the nation of Israel in a particular place and particular time, and because there isn’t a scriptural basis supporting a religious responsibility to commit violence in obedience to Christ, it can be concluded that Biblical Christianity has no form of jihad whatsoever. This can be seen to be especially true in light of the fact that jihad is not limited to a certain place and time, but rather is applicable to the adherents of the Muslim faith to this very day. Christianity does not have it’s own jihad. I am confused as to why many of you trying to defend the Crusades. They were anti-Christian in every way. The Church isn’t supposed to be some government whose responsibility it was to take back the Holy Lands from the Muslims by war. We are not called to a worldly kingdom, the kingdom we serve is not of this world. We are called to go out and make disciples, not raise up armies and take back the Holy Lands. Also I’d like to point out to those you who have astutely pointed out that this says nothing concerning the veracity of Christianity that you must be careful that you do not commit a straw-man fallacy yourself by resorting to such a response and not answering the question. Take the question for what it’s worth, answer it, and then if you feel it is needed, point out that this says nothing concerning the veracity of Christianity and the existence of God.